Nothing Like Metallics to Add Some Bling! I’ve been waiting to show you this!! Like, giddy with excitement!! 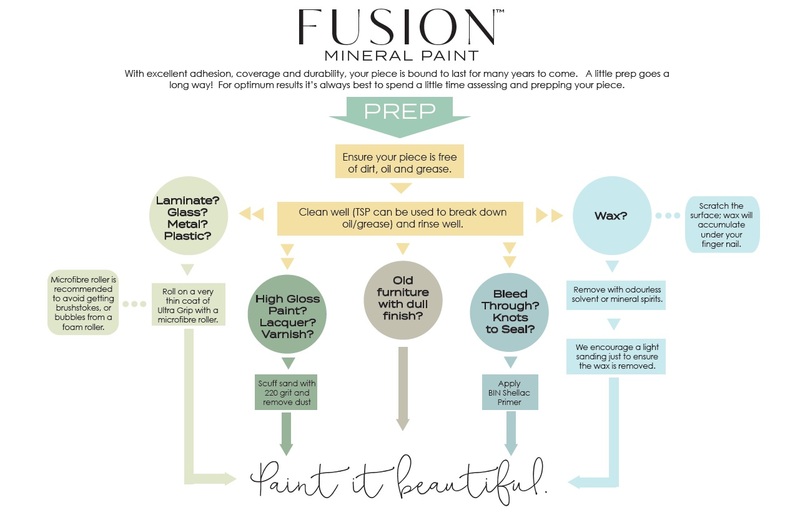 Fusion has put out three new metallic paints, Rose Gold, Champagne Gold, and Vintage Gold. I’ve been DYING to put some bling on some new things! 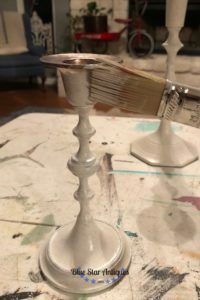 So I started with some candle sticks. I found these at a resale shop. 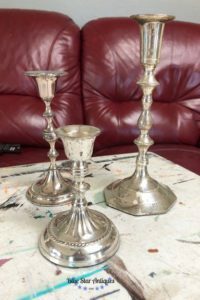 They’re silver plate but have outlasted their shine. 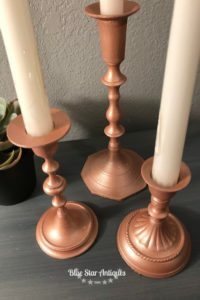 They needed a new lease on life and I knew that Rose Gold would be perfect! Usually, paint won’t stick to metal. The surface is too slick. That’s why Fusion created Ultra Grip. It makes the impossible possible! I like to use a sponge brush to apply Ultra Grip on small surfaces (and an automobile sponge for large ones). 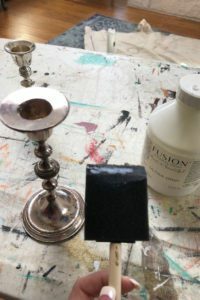 I just squirt a little bit of Ultra Grip on the sponge and apply it in a thin coat. The instructions say to let it dry 12 hours so I let it sit overnight. The metallic paints are sheer. It helps to have a base coat of paint under them. 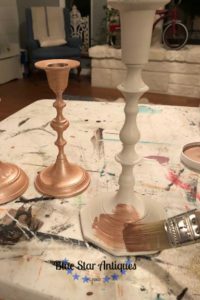 I chose to use Raw Silk as a base coat so that the natural color of the Rose Gold could shine through. I applied two coats using a 1″ synthetic brush and them them dry over night. Look at that shine! Such a big improvement over the tired silver, don’t you think?? 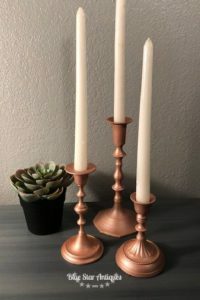 Wouldn’t this trio be pretty on a Christmas centerpiece of wedding decor!! Makes me want to break out the other two metallics on something else!